The Michelin star system has achieved of the status of being something of an institution in today’s culinary world. Those who have heard of it no doubt know that the prestige of this much lauded system even borders on the mythical. In North America, where Michelin stars are less common, the system’s background is characteristically overblown, being known to many as a largely European phenomenon which can make or break the career of a chef. The stars are perhaps most infamous for being associated with the common trope of the chef committing suicide upon losing a star. While such an occurrence is not impossible, I can at least attempt to soothe any disquiet you by asserting in all confidence that chefs are hardly throwing themselves on their tomato knives left and right either. The realities of the Michelin world in Europe are somewhat less dramatic than we tend to imagine them. While Michelin stars are by no means easy to receive, they aren’t exactly impossible to earn either. While the top of the category, restaurants having received three stars, are generally associated with stodginess and insane pricing (something which I have yet to have the chance to verify personally) my stay in Nice led me to realize that the lower starred restaurants can be not only affordable but also, quite surprisingly, within the means of the traveling student. Before truly diving into the restaurant we went to in Nice, it is necessary make a slight sidenote and mention that the Michelin system has itself lost quite a bit of prestige in recent decades. The famed system born of the tire company (I advise you to google their old mascot by the way, truly a creature that would haunt your nightmares) has fallen out of favor for many known food writers such as Paul Levy, due to strange rules and archaic classifications. For these people, the Michelin has been abandoned or re-evaluated in favour of the more recent Gault-Millau guide and a handful of others such smaller scale works such as Gilles Pudlowski Guide Pudlo. However, in France it remains to be said that in the majority of cases the Michelin guide, if not specific, is seen as remaining at least somewhat reliable. It is with this context that, Shannon and I decided to venture into a single starred Michelin establishment in Nice. Upon setting foot into Chef Christian Plumail’s L’Univers, we were immediately met by a disheartening décor which bordered on the kitsch, one which I’ve come to associate with people who fill vases with glass balls and who favour black melamine furniture. Thankfully the burning in our eyes was quickly offset by the tantalizing aromas emanating from the kitchen which acted as a strict reminder: we were there to eat. Upon inquiring about our reservation, Shannon and I received from the maitre d’hote the quick up and down look accompanied by the scrunched nose that is the international sign language signifier of contempt. If it was due to the Quebequois accent we spoke with, the somewhat travel-wrinkled clothing we wore or simply our age (further scrutiny revealed that the restaurant appeared to have more in common with a senior’s residence than just its décor) we’ll never know, but we swallowed our pride, greeted it all with a smile and boldly marched on to our much anticipated meal. The meal in question was an especially affordable seasonal set lunch menu whereby we were offered two courses for the very reasonable fee of 23 euros, we accepted this with gusto and our dedication to escaping a starred restaurant without taking a mortgage out on our meal no doubt validated our dear Maitre d’Hote’s conceptions of us. Considering the horrors of French Riviera tourist traps, we were only too glad to give L’Univers a go. Our meal began with a surprising complimentary amuse-gueule, which was quite delicious, it was a form of monkfish quenelle floating in the aioli of the region and accompanied by a wide selection of delightful artisanal sourdough buns. It was light and fresh, giving us confidence in our choice of restaurant while fulfilling its purpose by priming us for the appetizer. Appetizers are often my favorite course. However, in this case, although good, I was rather nonplussed. Shannon had a stuffed eggplant which evoked the ratatouille of the region in a comforting if not particularly marking way. 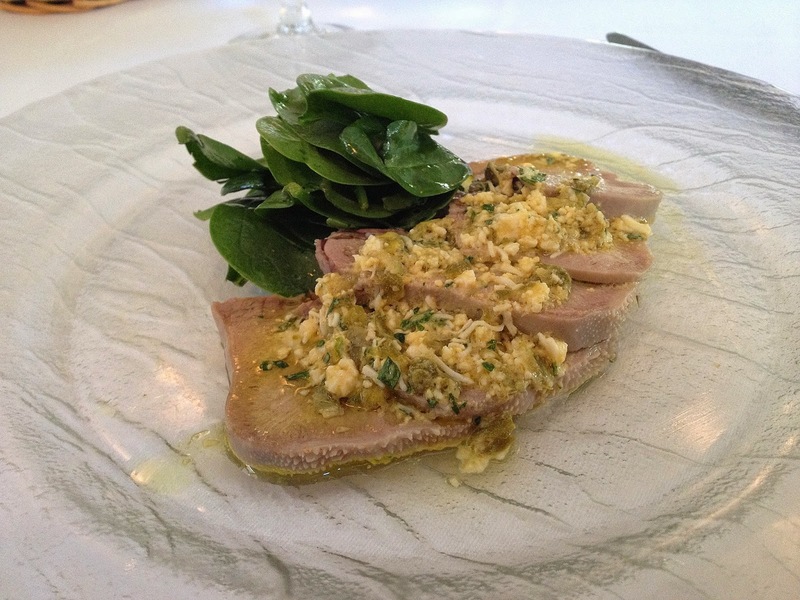 My choice, the pickled veal tongue with roquette, was tasty but nothing truly mind blowing, a sound foundation which led up to the main dish which we knew would either make or break the meal. With some trepiditation we awaited the main course, watching as the waiters circled around the restaurant like hawks, catching glimpses of food as it floated by, wondering if it was what we had ordered and attempting to do with our eyes what we wished to with our teeth. Finally, our dishes made their appearance, in the hands of our waiter Shannon’s soy glazed local pork chop and my Collin filet made their graceful descent from the heights of the kitchen to our lowly table, landing softly by grace of the waiter right before us without even a *thunk*. It the dish’s landing was soft, its impact remained significant as the delectable aroma floated towards us and our mouths started to water. Like most people who really appreciate food, Shannon and I were incapable of keeping our forks to ourselves diving into each others dishes as well as our own. 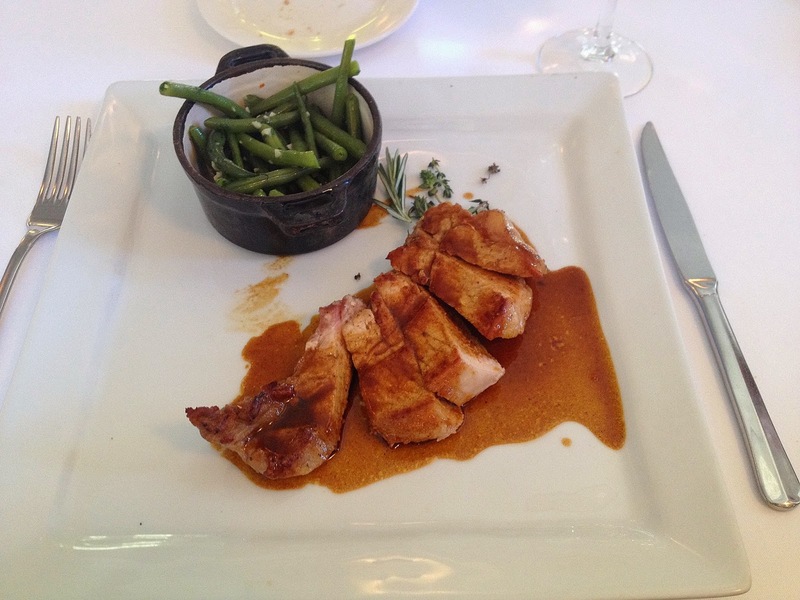 While Shannon’s pork with perfectly cooked green beans was very tasty, the clear winner we decided was the Collin fillet. 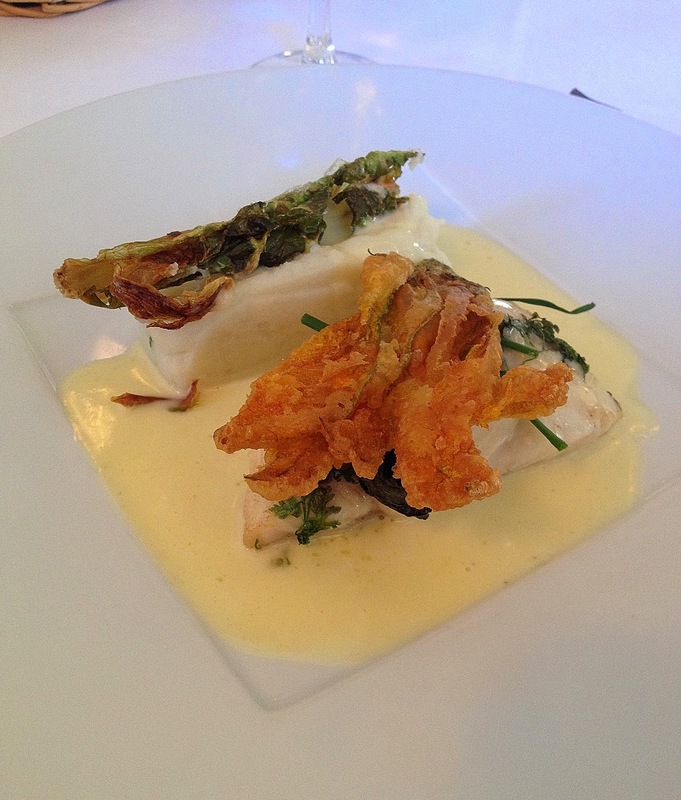 The otherwise humble white fish had been garnished by a rich and simple buttery sauce similar to an hollandaise and served with a delightful fried blossom which upon inquiring we discovered to have belonged to a courgette. The contrast in textures was remarkable, merging the smooth velvety sauce with the melt in your mouth fish finished with the surprising crunch provided by the squash flower. All this culminated in a dish which somehow managed to straddle the line between being rich and light, the courgette blossom in particular dispelled any shadows of doubts concerning the quality of the main dish leading to it all being dispatched with alacrity. This combination was suitably accompanied by delicate mashed cauliflower which provided a sound base upon which the main dishes flavours could rest without distracting from it. Finishing our meal with satisfaction, we were pleasantly surprised when upon requesting the bill we were each offered a pair of sweets; a macaron and Madeleine which capped the meal delightfully. Altogether, while it was perhaps not the most eye opening culinary experience of my life, if it was only slightly hindered by a sprinkling of snoot and bad décor, it was a great meal all the same. To return to our Michelin stars, despite the sometimes dubious nature of the system I must say in this case it did its job well. 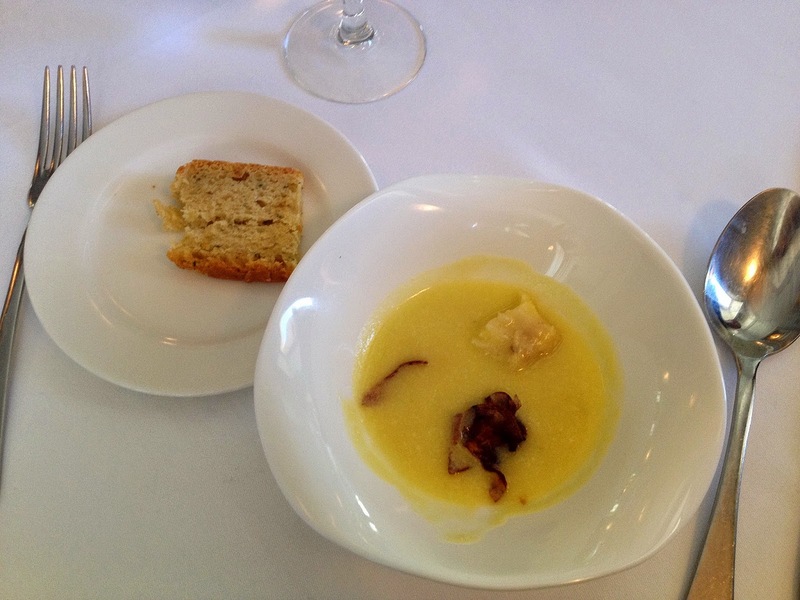 Though I must confess, I did double check the Gault-Millau rating of the restaurant as well! Kudos goes to Shannon and her Iphone for the photos, the great lumbering Nikon stayed home that day! Well, that’s the general gist of this post. I normally seek to excuse my tardy submissions by mentioning my overburdened schedule and my swamping workload but this time it’s a bit different. Why you may ask? Because not only am I working… I’ve been robbed of my kitchen! It’s rather hard to post to a cooking blog when one is kitchen-less! Well actually, that’s not totally apt, the kitchen is still mine but it appears that in reality it has been robbed of me. By what, by whom? Well the simple answer yet again is: by work. Now now, I’m sure this all sounds horrid, Nick without a kitchen, that’s like a pug without folds or the queen without corgies but in reality it’s not so bad so hold onto that sympathy. I’m not infiltrating North Korea, or perhaps worse, on a trip to Northern Ontario, I’m simply on a research trip…to France. More specifically, I’m in a region referred to as les Alpes Maritimes in a sleepy village called Villeneuve-Loubet which for those of you who may not have bothered with the French, is tellingly sandwiched between the famed Côte d’Azur and the French Alps. Now now now, before the urge to wring my neck like a gog-eyed turkey arises, let me remind you that I am, in all technically, here to work. So sun, sand (or rather pebbles) and castles aren’t the only thing on the agenda. This means that life is indeed slightly more challenging than the usual morning dilemma of choosing if I want to eat a pain au chocolat or croissant (the answer to that is inevitably an easy one, both). For those of you interested in the historical aspect, I am here to work at the Auguste Escoffier museum, studying the menus, recipes and work of the famed chef of the same name. Using material sources I hope to study how Escoffier affected the diffusion of French cuisine in Britain, among other places, and how this tied to different aspects of society. For more information on the topic, please feel free to consult my yet unwritten MA thesis. However this is a food blog, so here’s the scoop so far for anyone who might be inclined to dine in the area, as we’re on a student budget price is key. 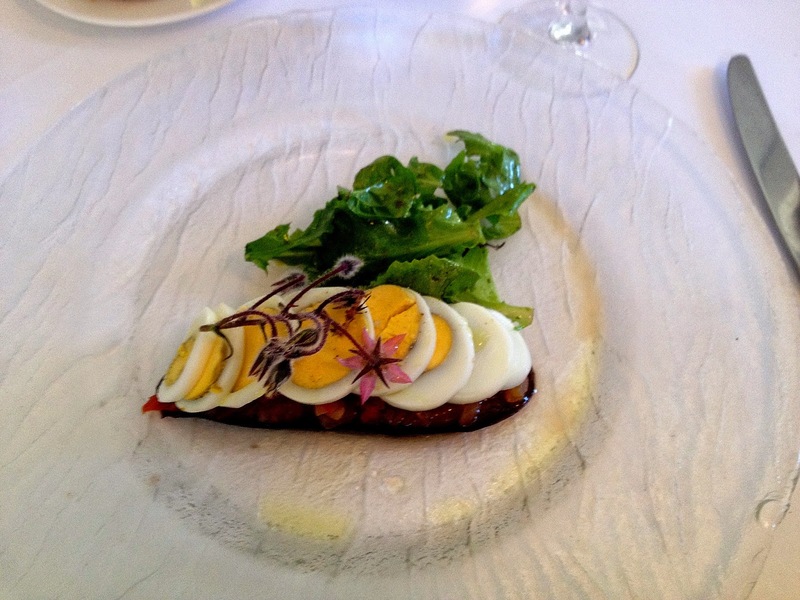 1) Salade Niçoise is, predictably, really big here…like it’s everywhere . Though the famed salad’s authenticity can be a touchy subject (green beans or not? What about garlic? Vinegar? AHHHHH!!!!) most cheap eateries seem to make it as a leafy tuna salad with hardboiled eggs. Might not be authentic, but it does hit the spot. 2) Also, you can have something similar to a Niçoise but in a sandwich called a “Pan Bagnat”, this make a great lunch or dinner, and ours are available at our delightful bakery in town here! 3) When it comes to eating out, it is important to note that most restaurants seem more prone to serving lunch (déjeuner) over supper (diner), actually in the wee villages out here sandwich boards sporting menus tend to eclipse themselves around two in the afternoon and restaurants then close their kitchens, generally only serving beverages such as coffee, wine or the local pastis (an anis based beverage) from this point on. 4) While this is much less of a problem in Nice central, the issue of eating out there is far more complicated due to the treacherous swamp of touristy joints willing to swindle you out of your hard earned euros (certainly with this exchange rate, eek!) in exchange for mediocre seafood or steaks, limp fries and frozen veg. Prices here are quite steep for a travelling student and quality/ price ratios on sit down meals can be heartbreaking. Though do keep in mind, that tax and tip is included in the cost of the meal (yay! No mental math!). 5) Never fear however! Nice, like apparently everywhere in France, is loaded with cheap wine, cheese, bread, sausage and pastry which is (mostly) absolutely delicious. The region is also laden with delicious olives. So word of advice should you choose to venture down here? Opt for the picnic. 6) EXCEPT! When you feel inclined to sniff out a relatively snazzier join and maybe splurging a tad, our splurge was the delectable Michelin starred “L’Univers” of chef Christian Plumail who offers a delicious lunch on weekdays for the equally tasty price of 23€…but that is a story for the next post!